M15 is the love letter to players M14 should have been. There are a lot of new powerful cards including four new Planeswalkers, a few old favorites revisited, the fourth entry in the decade run of You Make the Card, and an entire run of guest designed cards. I haven’t seen people this jazzed about a core set since M10. It’s important to remember when reading any set review that we are forced to evaluate cards in a pseudo-vacuum, but they never exist as such. When I look at Brimaz I have to consider the card individually, free of whatever the metagame looks like that particular month. Brimaz’s text box isn’t going to change but the cards other people are playing are. I need to focus on what concrete information I have available to me. Because of this set reviews are especially challenging. I have to look at Brimaz and make an evaluation based strictly on the words printed on the card, but his true worth will be dependent on the cards around him, a pool that will change significantly over time. Cards that are excellent right now may have been trash in an alternate timeline. 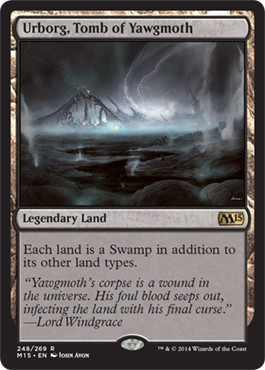 It would be easy to construct a Standard environment where Desecration Demon is crap (such as INN-RTR,) or where Prime Speaker Zegana is a chase mythic. Even the hallowed Jace was bad at release since there wasn’t a single other playable blue card in the format and Bloodbraid Elf + Blightning threatened to shut him down as soon as he resolved. The point I’m making is that when considering this review, and all other reviews, it’s important to be good Bayesians and recognize that a powerful card should be good and a weaker, situational card should be bad, but the constraints of the format around them, complete unknowns to the hapless reviewer, will be the true determining factor in identifying whether a card is a bulk mythic or a $20 rare. I’ve structured my review to identify which cards are bulk, and of those that aren’t, what I think their prices may be around this fall’s rotation, and sometime about six months from now in January, ahead of the second Khans set. Anything in the bulk section means it’s cheap now ($2 or under) and will still be cheap at basically all points. I’ll outline a few rules of thumb for evaluating Planeswalkers, since we’re going to be doing it a bunch this set. It’s important that a Planeswalker be capable of protecting itself. If you play it into a board where you have no threats and they have one guy or two small guys, can the Planeswalker keep itself alive? What’s the mana cost look like? Four and under and a walker can reasonably be considered competitive. Over four and the bar is much higher. Elspeth is an example of an exception to the rule. Finally, how flexible is the walker? Koth required your deck to have a critical mass of actual Mountains to be worth running. Nissa Revane wanted you to play a pile of elves. Jace, The Mind Sculptor…wanted you to be capable of paying for his mana cost. That’s it. 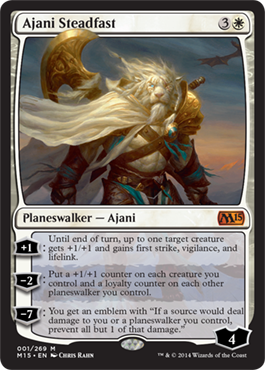 Ajani isn’t the hottest at protecting himself. There’s no body generated, which means that if you don’t already have someone to run interference he can’t make one. What’s worse is that his +1 is a total blank without anything in play, so you can’t even run him out into certain death to try and grind some advantage, as you can with Jace, Architect of Thought. On the other hand, his mana cost is quite friendly. There have only ever been two other XC Planeswalkers; Chandra Firebrand and Garruk Relentless. Firebrand was a flop but Relentless was important his entire time in Standard. 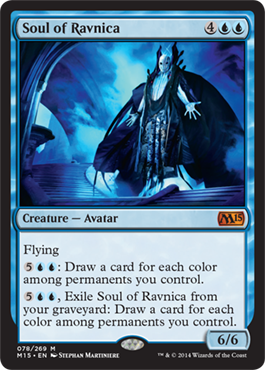 A four mana walker with only a single colored symbol is quite flexible in its applications, which will help him find plenty of homes. Given how his abilities work, that is clearly critical for his success. Ajani can’t do much at all on his own which is going to keep him from the big leauges. JAoT drew cards. Domri (sometimes) drew cards. Elspeth creates an army. All of them could gain advantage on an empty board, which Ajani can’t. What he does do for you is provide awesome support for your team. One solid creature on the board makes his +1 pretty legitimate. You get a “free” attack because of the vigilance as well as a nice buffer of life. His -2 is worth at least five mana if we’re looking at Gavony Township as the bar, and his adds counters to other Planeswalkers as well, which is certainly worth something. Since Ajani requires support in play you can’t run him as a four-of. Being almost entirely relegated to a pair or perhaps set in most lists will prevent him from climbing much. I anticipate he’ll see some mild success in aggro or midrange GW builds, and if a Bant walkers style list pops up he’ll likely have a slot. He should keep dropping towards $10 as we come up on Khans, and by next January he’ll probably be pretty close to his floor in the $7-$10 range. Most recognize that Gryff’s impact will be felt mostly on Modern, which is the format that will primarily be responsible for driving the value. A flash Torpor Orb that attacks is pretty cool, although dying to half an Electrolyze is sort of a bummer. Thalia isn’t more than $6 and she’s better in more places, so I don’t think Gryff can climb above that for awhile. I also don’t believe there will be enough demand for his ability in Standard for his presence there to matter much, although if Khans is an ETB-heavy set it could do a bit better. Overall I’d mostly expect him to fare a tad better than Spirit of the Labyrinth. Preeminent Captain was over $5 before the reprint, so clearly there’s some demand for this effect. He was printed in Morningtide though, which is one of the sets most poised for inflated prices in modern Magic. 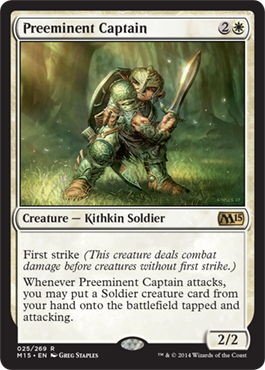 This second printing should satiate most all the casual demand and unless we get some sicknasty soldiers in Khans, he’ll probably function as reasonably popular card in some white aggro build. Unfortunately for him there’s only ever going to be one deck that wants him, which means his price is pretty capped. This isn’t going anywhere before rotation, so let the price get nice and low before you buy any copies you want. The format is likely far too hostile for this to matter yet. It’s after rotation that this gets interesting. Clearly the card is powerful; most who write set reviews with an eye towards playability have taken the time to discuss it. 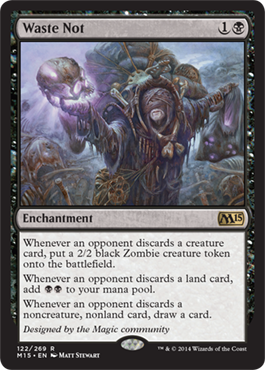 What really seems to set up this card is that there is a lot of graveyard interaction showing up in M15, possibly hinting at a graveyard theme or subtheme in Khans. If that’s the case then the resources this really needs to take off could be coming. If they do this may end up as a tier one or tier two deck ala The Aristocrats. If we don’t get enough enablers, it will relish in barley-bulk levels as FNMers try week in and week out to make fetch happen. A card like this is really difficult to provide a price for since it so wildly depends on what the format looks like. Instead I’m telling you what we need to see for it to matter. Watch for my Khans review to see if it looks like the seeds are planted. 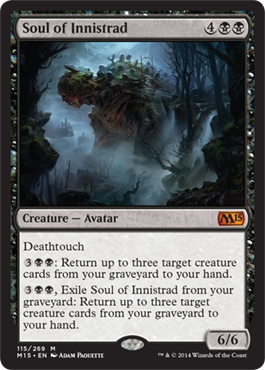 Hey remember about twenty seconds ago when I said we were seeing an oddly large amount of graveyard interaction in a core set? Well look at that! An entire mythic cycle of clearly Standard playable creatures with graveyard interaction. SoT is one of the better souls. If you can afford him you can afford his activated ability, which a single attack with can completely turn the game around. Even if he’s your only creature you’re still threatening a sixteen point life swing while still holding up a 6/6 to block. His graveyard ability is also excellent in midrangey decks, letting you threaten a massive combat trick at all times after turn six. As a 6/6 with vigilance and two solid abilities, I like SoT’s chances a lot. The only thing really holding him back is that he shares a casting cost with Elspeth. 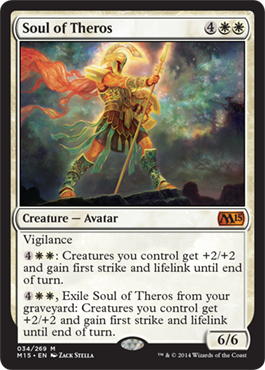 Soul of Theros should tick down between now and rotation as it’s unlikely he will explode out of the gates, but he won’t drop too far because people will be eager to see what happens after September. This time next January it’s more probable that he continues to slip towards $5 with mild to moderate use, but anything is possible. I don’t expect him to be $12-$20, but I recognize it as a possibility if he becomes one of the marquee cards of the set. This card has flown under the radar a bit, but it’s definitely capable of being a big player in Standard. Getting an extra 1/1 flyer out of every creature you play is quite valuable for attritiony decks, and having a way to turn those tokens into indestructibility is just icing on the cake. 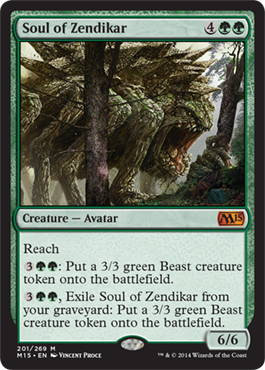 Like most M15 cards I don’t expect this will have an impact by the time rotation comes around, but there’s certainly a real chance this could become a $2-$3 rare at least as things shake out. Score these as throw-ins where you can. Evacuation is $2 with six printings. Cyclonic Rift is $3+ with a positive outlook. Aetherspouts is in the same family. You won’t get to flip all their artifacts and enchantments as you do with Cyclonic Rift. Instead you either get a pseudo-wrath by forcing them to pile creatures on the bottom of their library, or you set their draw step back several turns with perfect knowledge of what’s coming. It’s possible to play around but if they’re doing that they’re not attacking, so you’re getting virtual advantage from that alone. I see this getting played as a pseudo-wrath in blue decks that don’t have access to whatever sweeper we end up with. It will probably hang around in the $1-$2 range, but if the pieces come together just right it could reach $5. I know Adrian Sullivan’s RUG list I was playing this year would have really enjoyed having access to this. Another favorite card of mine, Prophet of Kruphix, can really provide a platform for this to shine. This guy is undoubtedly cool, and there’s precedent for this effect being expensive in the form of Mycosynth Golem. The problem is that there are going to be so many more copies than Golem and it’s unlikely we’ll have enough real support for him in Standard to matter. Even Grand Architect couldn’t break the few dollar barrier and that was in Scars of Mirrodin when my trade binder had eleven or twelve pages of artifacts. 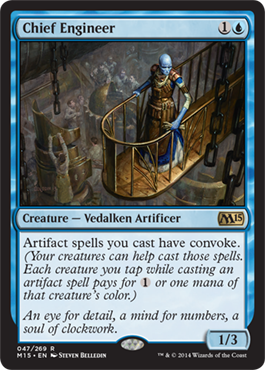 Engineer may indeed sneak into something in Modern since the support is so much more robust there, but if that does in fact happen the in-print rare is not going to be the expensive card in that deck. Jace isn’t nearly as bad as many others think he is. He’s immediately capable of flipping their biggest threat back to their hand, so he passes the first Planeswalker test, even if it is a bit pricey to do so. We certainly can’t be upset about his mana cost. He doesn’t require anything specific out of your deck construction, which is great. The starting loyalty is excellent, which is a sort of protection as it is. His ultimate is pretty dang strong. The only real issue is that his +1 appears to be on the weaker side of things. It’s better than scry one, but probably a bit worse than scry two, since if you flip two lands you can’t ship them both to the bottom. Not getting a full mana’s worth of value out of his +1 is pretty tough. Of course, you’re almost definitely getting the requisite amount of value out of that +1 if you have cards in your deck you want in your graveyard. Like, hmm, maybe Souls or whatever else Khans brings us. Jace is not going anywhere in the near future. We won’t know how potentially relevant he is until we start getting Khans spoilers. Assume that there won’t be any heavy graveyard payoff and trade him away accordingly, but check back in to my review at Khans to reassess. 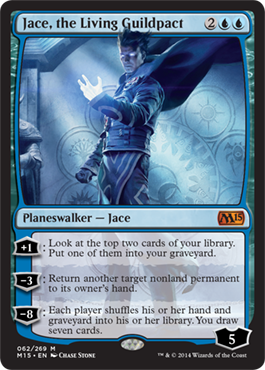 Nearly every Jace has been under-received relative to their actual playtime thus far, and I wouldn’t be surprised if that is happening again. Chapin is a fan, although he thought the activated abilities were 3UU, not 5UU. At five mana the abilities are insane. At seven mana they’re merely fair. SoR is not going to take over a game immediately in the way that SoT may but it’s ability to draw you cards on command for as long as it sits in play will definitely dominate the long game. Even if they Thoughtseize or Doom Blade it you’re still going to have the option to just get paid on any end of turn you wish. A 6/6 flyer for six that draws you one to three cards as needed is a serious threat. It’s not as splashy as SoT or Soul of Phyrexia but it’s definitely got the power to hang. 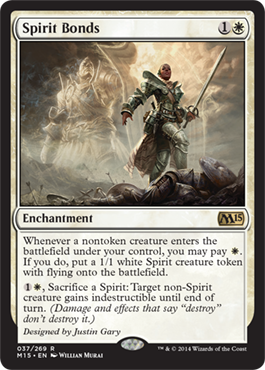 It’s on SCG right now for a mere $3 which seems low as it’s probably in the better half of Souls, but this is because it’s one of the DOTP promos. There will be enough extra copies in the market to keep the price fairly suppressed unless it becomes a major component of the Standard landscape. 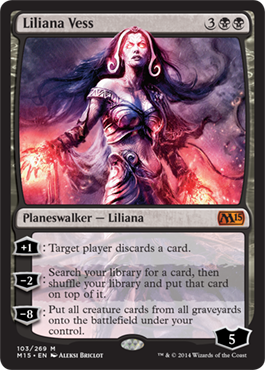 M15 will make the sixth time this particular iteration of Liliana has been printed. In spite of this she has carried a $10+ price tag until now. Clearly the casual demand is there. Like most reprinted walkers, her price will decline in the short term but by this time next year, and perhaps even sooner, she’ll start rebounding a bit. Liliana will be a solid grab when she bottoms out. I was conflicted about where to list Ob Nixilis. At first I was going to list him as bulk, but the appeal to the EDH crowd was enough for me to include him. He won’t matter in Standard unless we get fetches in Khans (which I put at < 5%,) but he will have fringe playability in Modern and reasonable demand in 99 card formats. I admittedly don’t see him showing up too much in Modern, but it’s possible there will occasionally be decks that want access to the effect. In EDH he’s pretty nifty as he can really stymie opponent’s board development, and anything that sweeps a bunch of smaller guys away will turn him into a legitimate threat pretty quickly. I like foils of Ob Nixilis down the road. Even though he’s in the right colors for Standard success, SoI’s ability isn’t especially splashy. It’s most surely grindy and attritiony, but it doesn’t read as exciting as SoT or SoS. He loops back around to that potential graveyard theme we were discussing earlier. If it shows up, he could be a serious component of the metagame as an enabler of all sorts of shenanigans. If not, he’ll most just be a 6/6 that grinds out value over the long game. In the latter situation he won’t see enough play to drive his price much. Meanwhile there will be reasonable EDH demand for this guy in a way that we won’t see on most of the others in the cycle. It’s hard to imagine a black deck that wouldn’t be happy with this ability. Like Ob Nixilis, foils will be juicy targets. Waste Not occupies a space few other cards do; it is drenched in casual appeal, yet also possibly pushed hard enough to be playable in Standard. As an added twist of flavor it’s the You Make The Card card. That alone won’t save the card, but it certainly won’t hurt it either. Liliana’s Caress is a $3 uncommon so there is precedent for this type of card being worth a reasonable amount. This will slowly drop while it’s in Standard and copies make their way into unsleeved kitchen table decks everywhere, but sometime between December and July it will start to pull back up again. This is all assuming that it isn’t good enough to make it in Standard. Thoughtseize is certainly a reasonable enabler and if we get another incidental discard effect that’s playable on its own this could make it into FNMs. If that happens the floor on this will only be $2-$4 before it starts to climb again. I just wish Whispering Madness wasn’t rotating. Like Liliana, Chandra will take a dip in the meantime but will climb again once we get past M15. 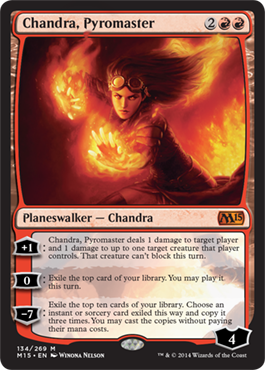 Unlike Liliana, Chandra is a good bit more powerful and therefore much more likely to show up in Standard. In six months time she may not have caught on again, and if that happens, she’ll be near her floor. If she does end up doing work before then, perhaps alongside Prophetic Flamespeaker, a rebound into double digits is plausible. We know this card is playable because it’s the Buy-A-Box promo. He’s also a goblin, which continues to carry casual demand, as Krenko has illustrated. These prices I’m giving you are basically his floor at those given times assuming he sees zero to mild Standard play. 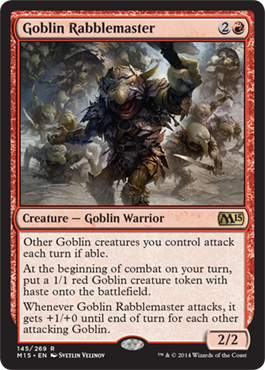 If goblins is A Thing in Standard, he could easily reach $6-$10. Soul of Shandalar may end up being the best of the bunch. First strike means SoS is going to win nearly every battle she (?) gets into. The activated ability continues to pressure people’s life totals while eating small blockers. It can even be used to put some damage on a high-toughness creature ahead of first strike damage to take down large targets in combat, effectively making her a nine power first-striker when you have five mana up. She’s a nightmare to block and is capable of dealing damage straight to the face even if you can’t get through for some reason. She really does it all – she attacks well, she can pressure a life total through a clogged board state, and she can remove smaller targets. I think that SoS may be the best in the Soul cycle. It likely won’t get there before September, but SoS will be poised to do great work in Standard once things shake up a bit. If her play is on the lighter end of things she’ll probably be $5 or so. If she ends up being a top ten card in the format then $10-$15+ is possible. Watch the Pro Tour closely to see how she performs; this could end up being one of the most lucrative cards of the set in the mid-term. If you didn’t see this coming you weren’t paying attention. 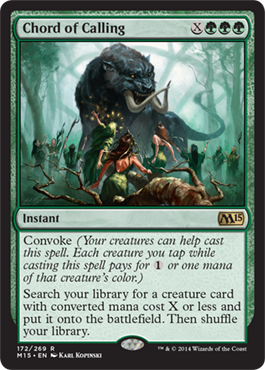 As soon as they announced convoke as the returning mechanic it should have been clear as day that we were getting Chord. Wizards has shown time and time again that they can and will reprint Modern cards that need it. For a little while Chord held the lauded role of the most expensive card in Modern that didn’t deserve it. It’s since dropped to a more “reasonable” level of $30, but that price was sustained because of the very limited supply of a Ravnica rare in conjunction with Pod regularly being the best deck in the format. Now that Chord is a core set rare, that price is going to get absolutely crushed. The supply here will be more than enough to satiate the Modern demand for the card, which means the price will fall accordingly. Original Ravnica foils will still command a premium, but that’s the only thing that will withstand the glut of new copies. I can’t quite figure out what I think about Genesis Hydra. You basically never want to cast this for anything less than X=3, so he’s really a five or six drop at best. Paying five mana for a 3/3 and hopefully a little something else for your trouble is reasonable, and it gets much better quickly. Putting seven mana in is almost always going to be worth it. At X=5 you can get a 5/5 and “settle” for a Polukranos all for seven mana, which is a real sweet deal. Seven may sound like a lot but most green decks, especially ones with Nykthos, can get there without much effort. 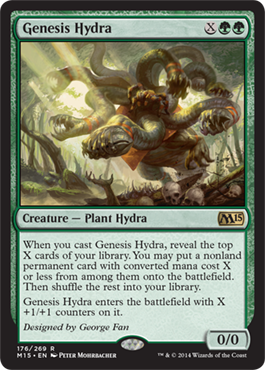 The prevalence of Caryatid and Courser certainly bodes well for Genesis Hydra, and the type of deck Hydra is good in would probably want him as a three- or four-of. Will that deck and his performance in it be good enough to push him into the spotlight though? It probably depends heavily on what good two, three, and four drops we get. Reclamation Sage is a pretty great place to start, as is Banishing Light. If we get another solid ETB four drop and maybe a two drop he could climb up to at least a few bucks. If the support doesn’t quite emerge he’ll end up in the bulk bin. I’ll let others gush about Nissa. Suffice to say that she’s dang powerful, and is in exactly the color that can get her into play soon enough to be extremely threatening. 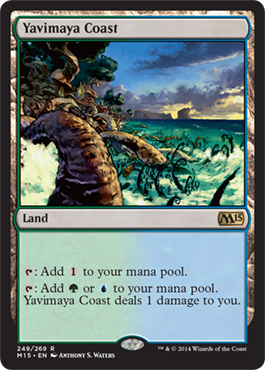 With cards like Genesis Hydra and Nykthos to pair with her land untapping, the seeds are sown for a big mana list. 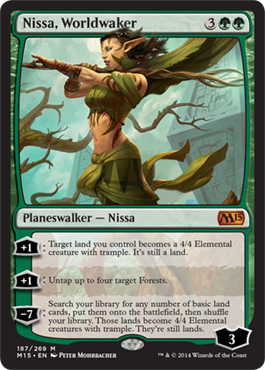 The only thing preventing her from flat out being the unquestionably best walker in Standard is that it says “forest” instead of “land.” She’ll still be powerful, but any deck that runs her is going to need a critical mass of forests, which will restrict her utility. If she sees enough play out of the gate her price will not drop at all. I’m not expecting her to make big waves immediately though, as Lifebane Zombie is still going to put too much pressure on anything too reliant on green creatures. She should slip until rotation, but probably not by too much. Not only will Standard brewers want to get their hands on copies, but casual demand will really help shore up price loss. It’s tough to say where she’ll be by January. If she sees very minor play in standard she’ll be in the $12-$15 range just on FNM and casual demand. If she’s played to moderate success, as Kiora is/has been, expect her to be closer to $20. If the Khans land cycle amazingly has land types or if we’re on the verge of the green renaissance, she could easily be $30. All we can really do is wait and see. If there is a green renaissance, it probably isn’t going to involve this guy. Reach is useful but isn’t nearly as strong as flying or trample. Making 3/3’s is fine but activating it once doesn’t have the power to take over a game like some of the other abilities. It’s also likely the worst one from the graveyard. Add in that he’s a promo for DotP and we’ve got a bulk mythic. Is Garruk cool? No doubt. He’s big, his first +1 is splashy, and he’s got four abilities. Unfortunately cool doesn’t equate with value. It’s possible he could come down and take out an Elspeth and run away with the game, but what is far more likely is that he makes a 3/3 deathtouch then eats a Hero’s Downfall or Banishing Light or Detention Sphere or Dreadbore or [Khans PW removal spell]. This is all assuming you’re still alive when you get to seven and he hasn’t been Thoughtseized. When Nicol Bolas came down he either destroyed the best permanent in play or gained control of it. There were also no spells in the format that said “destroy target Planeswalker.” The times have changed, and Garruk is just not going to do enough when he resolves for how easy it can be to top deck an answer. Even if they don’t have the removal in hand, Garruk could easily tick up three times, die to a found answer, and not have done enough on the board to win the game. 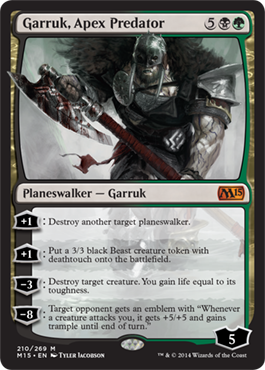 I certainly like Garruk, and he’ll be fun at FNM, but I doubt he’ll be able to hang. The price is high right now because he’s the marquee Planeswalker. As demand from the casual market is sated and tournament results continue to lack his presence, his price will slip further and further. He will rebound eventually and start climbing, but I wouldn’t be surprised to see him get as low as $5-$8 before he does. Maybe Slivers are competitive for the last two months of this Standard, but I doubt it. What’s more likely is that a few people try it at FNM and it can’t withstand the assault of Mono-Black and Mono-Blue. Hivelord will fade from relevance after rotation, and the price will keep dropping until it begins to rebound sometime next year. This will be a great card to drop at the floor though. Oblivion Stone climbed towards $15 during its height before being reprinted. Nevinyrral’s Disk was a major factor in multiple formats over the years and remains several bucks. 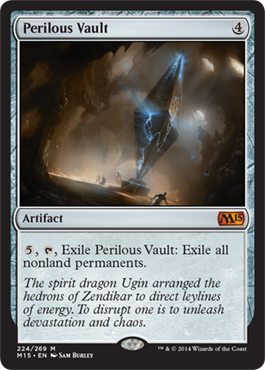 Perilous Vault is a powerful artifact in this same vein. Exiling is a big step up from destroying in nearly all situations. 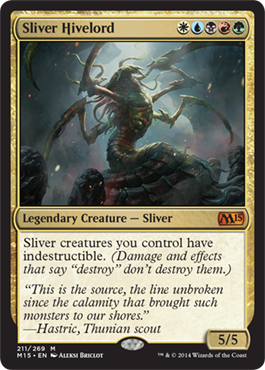 The biggest exception that comes to mind is if you control a Wurmcoil (RG Tron), but the damage from that can be mitigated. Universal sweepers aren’t typically available to all colors, but when they are they’re greatly appreciated. All is Dust is a solid $15+ despite existing as a GP Promo. The effects of Vault will not be felt immediately, but it will probably come out to play multiple times over it’s tenure in Standard. Not only that, it will show up in Modern, Legacy, and EDH. While no format is likely to see it become a pillar, it will be an important tool in each. My expectation is that Vault will behave similar to many mythics that will have a smallish impact in Standard but are needed for other formats. The price will drop for a time, but will rebound and continue to grow, possibly upwards of $20, after enough time has passed. Salvaged Mirrodin art aside, is Engine it? 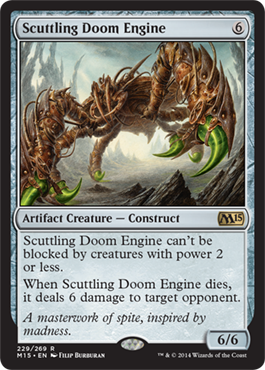 Is a card with a name as stupid as Scuttling Doom Engine the sleeper of the set? We’ve got a colorless 6/6 for 6 that can’t be blocked by Carytid, Courser, or Elspeth Tokens that can kill most Planeswalkers (and sometimes players) if it dies. If you connect with Doom Engine just one time and then Doom Blade it you’ve done twelve damage to your opponent. Unless they chain this guy to some rocks or Path to Exile gets reprinted, he’s going to be a headache for most challengers. Factor in cards like Chief Engineer that set up even faster Doom Engines or graveyard recursion and you’ve got a solid plan in any color that wants it. I could easily see this at $10 if it ends up being one of the best rares in the set, which is entirely possible. If it slips into bulk status I’ll probably snag a bunch. 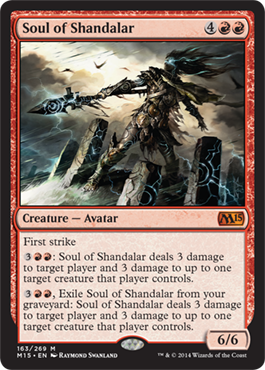 Indestructible on demand is useful, but I’m not sure it’s “better than all of the souls in my colors” useful, especially at five mana per activation. The activated abilities of other Souls are basically relevant at all times, but this guy really only can pay you if they’re threatening a huge board state or have non-exile removal. Other than that, he’s “just” a 6/6 trampler. That’s obviously nothing to shake a stick at, but competition is fierce these days. I think I’d rather have Doom Engine most of the time, honestly. I’m willing to be wrong about this though. SCG has preorders at $15 which just feels real high to me. If this was instead listed at $6 I don’t think I would find it odd. Unless this card is just way better than I think it is it will continue to slip towards the $5 range. Chain Veil is a very cool card, hands down. While the wording may be inelegant, it has in fact been confirmed that this can ‘go infinite,’ with say a Ral Zarek, Nissa, and four forests. 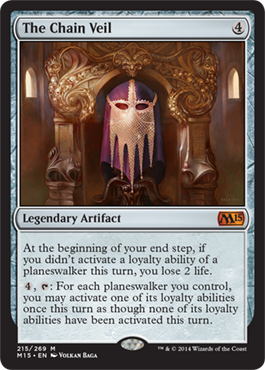 (It’s not actually infinite infinite because if you use Ral’s ultimate and fail all five flips you can’t keep untap the Veil, but at least you get infinite Planeswalker loyalty.) It will be popular in some EDH decks and in casual circles, but I have real trouble imagining this being good enough in any other format. The price will drop for awhile, but like Perilous Vault, this will be a great pickup at its floor as casual demand will continue to push it towards $10 without a reprint. Barring a breakout Standard performance, Sliver Hive should settle in the low dollars range. Casual appeal will keep the card out of bulk status, but it won’t climb north of $5 for quite some time. The price on this won’t drop too rapidly, but by January the market should be pretty well saturated. I’m not anticipating heavy Standard play on this guy and my price expectations reflect that. A single copy will be a freeroll in anything that plays black, but that’s just one lonely copy. It’s tough to imagine what deck wants four of these. I do really like foils though. The PLC foils are a solid $50. The M15 ones could easily be $30-$40. Right now they may be preordering for around that, but if they drop towards $20 I’d be happy to trade for them. 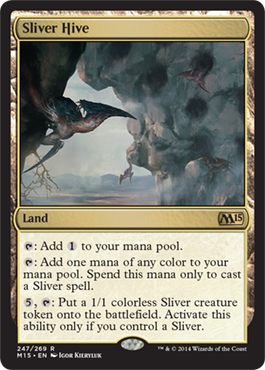 The fact that the price of all of these lands started rising after they were announced in M15 is a testament to how little many people understand about card value. Once the initial wave of M15 hits the prices should settle nicely in the few dollar range, with Shivan Reef perhaps being a tad more than the others thanks to more Modern demand. The M10 Checklands showed us that despite an enormous quantity in the market the price on quiet staple lands can still hang around a few dollars. I expect no different here. Mono red decks are going to hate this. Red aggro will have serious trouble getting through and burning it is out of the question. Chord of Calling can flash it out for a very nasty blocking combat trick. Coupled with regeneration or indestructibility and the nest will never leave. This card is dangerous. 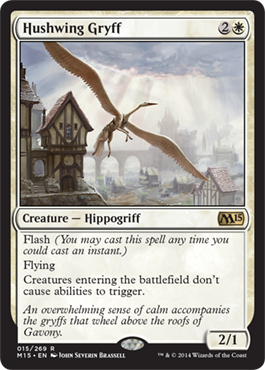 Coupled with Ornihopter, this is a potential 5/5 flyer on turn 2 that can attack right away. In modern, if you cast this on Darksteel Relic, you’ll have yourself a 5/5 indestructible on turn 2 that can attack right away. 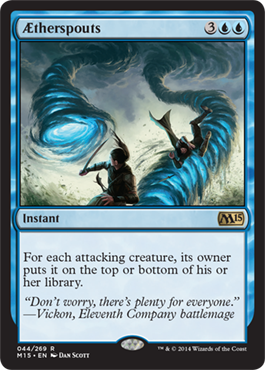 How well do you think this would work in monoblue devotion? Holy crap this card is strong. Helps creatures dodge removal and reactivates ETB triggers (Snapcaster Mage). Something tells me this card is really good. You can still play mana rocks and ramp spells and the effect can also be activated on the opponent’s turn. Necromancer’s Stockpile: Dredge can be a thing in modern with this. Aggressive Mining: New Necropotence, I remember back in the day the combo Necro, Zuran Orb and this sounds like one card that does the same. I think you’re severely underestimating the power that slivers have with m15. Striking and venom gives a very deadly turn 2 board. Leeching stacks, which makes multiples unbelievable. Chord makes hivelord viable on turn 3, and galerider dodges most standard meta blockers. 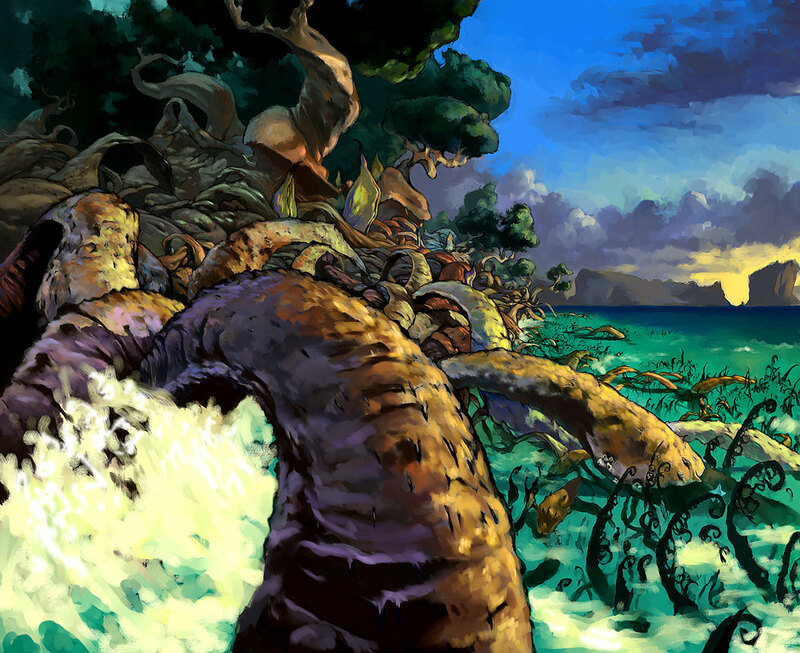 Diffusion means you no longer lose to the spot removal of midrange or control decks. Manaweft and blur let you mass a board in no time on turn 3, and you have tons of options to protect against boardwipe, like ready / willing (great with manaweft), rootborn defenses ( great with hive stirrings), and Boros charm, which is just super cheap. Oh and my favorite, chording into a hivelord. Maybe it won’t be viable, but I’ve been running slivers without the inanely powerful m15 ones for some time now and they’ve been doing quite well against the majority of the meta.